A very simple white look today enhanced by the pearl embellishments on the sheer top and Gold embroidered cat loafers. Clearly the Cat loafers are a very cheap (€15) Charlotte Olympia knock off from New Yorker, the stitching was white and looked horribly cheap so I simply bought a gold marker and transformed the stitching to being a lush gold. 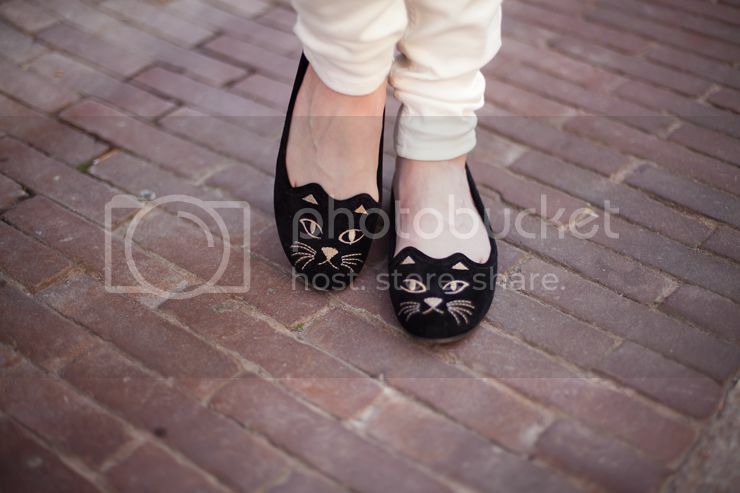 I just happened to bump into the Cat loafers when I went to the New Yorker store for cheap light blue sneakers that I had seen there but they were no longer there in my size so I decided to give the Kitty Cats a go! I often change the color of stitching in shoes and even clothing to transform something from looking hideous to looking fab! Simple and lovely. The flats are too cute. wow, great idea! you look beautiful! I love it how you “tuned” them! 🙂 Nice outfit! love what you did to them! and those shoes are so cute! Your outfit is perfect as always! Great idea, they look amazing! oohhh you are the loveliest girl I have ever seen! aw the shoes are just adorable!